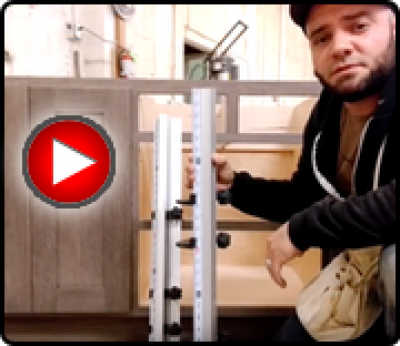 The Slide Pro is a fast, hands-free installation system for any drawer slide. Install a whole set of slides at once, instead of one at a time! Use the adjustment shelves to align with the cabinet railings, then tighten the tension knobs to hold in place, and install the drawer slides to the perfect height every time. It is durability and accurate measurements make it great in the shop and out on the job for any cabinet drawer installations. MAX INSTALLATION HEIGHT OF SLIDES: 26.75"
Is this the same extrusion as the SafeCut Ruler? Yes, it’s the same extrusion as the SafeCut Ruler, so if you purchase one, you can use any of the SafeCut accessories with it, once you remove the 4 plastic pieces for drawer slide installation. Also if you already own a SafeCut Ruler, you may purchase the “Slide Pro Parts”, and get just the plastic pieces to convert it. 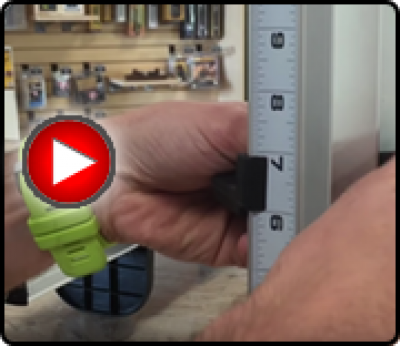 Just remember the measurement scale will not work the same, and the SafeCut Ruler might not be cut to the ideal length for all applications (the Slide Pro is 27.5”). How would they work for inset face frame cabinets? They will work just great. You will just have to use both of them on one side, to support the front and back of the drawer slide on that one side, and then switch both (keeping them same height) to the other side of the cabinet. How would they work on a Euro frame? It would work in any environment. It sits inside the frame.